To call Schneider the most important woman in jazz is missing the point two ways. She’s a major composer—period. With the recent release of Allégresse… Schneider has earned a place of honor among the jazz composers of our time. With her third album, Allégresse, composer/conductor Schneider… has painted her masterpiece. …This could very well be the finest jazz album of the year, although it has an allure that transcends genre. Maria Schneider continues to astonish with music of beauty and profundity. Schneider has clearly learned Lester Young’s gentle advice for those mining the jazz tradition: “You got to be original, man.” Allégresse is a landmark release for Schneider. … the orchestra is the star. Precise without being stiff, this outfit has the dynamic balance and ensemble clarity to bring out the details and nuances in Schneider’s compelling writing. Composer-conductor Schneider adds to her collection of marvelous works with this album (Allégresse), which could be the best big-band album in several years. …this album is nothing short of a must. If anyone is passing out awards for new American music, he should consider composer Maria Schneider. The band contains some of New York’s finest (if not most famous) players… They do not so much play Schneider’s works as caress them, as paint them with a fine-haired brush. Allégresse is one of the year’s most beautiful releases. The score ("Dissolution" as premiered with the Pilobolus dance company-June, 1998) brilliantly merges modern jazz and modern classical writing. This performance marks Schneider as an original thinker and an arranger to be reckoned with, regardless of genre. Ms. Schneider triumphs as a purveyor of beauty, through song, along with a deeply personalized and seemingly unyielding commitment to her craft. Allégresse is the complete package and should be deemed essential listening for ardent fans of orchestral/big band music or jazz lovers alike. Strongly recommended! This (Allégresse) is seriously gorgeous stuff. The number of true colorists with a thirst for vivid or subtle new textures, able to engagingly express themselves through the broad canvas of an orchestra or big band simply don’t arrive every day, or even every year. This makes Maria Schneider an uncommon bird indeed. 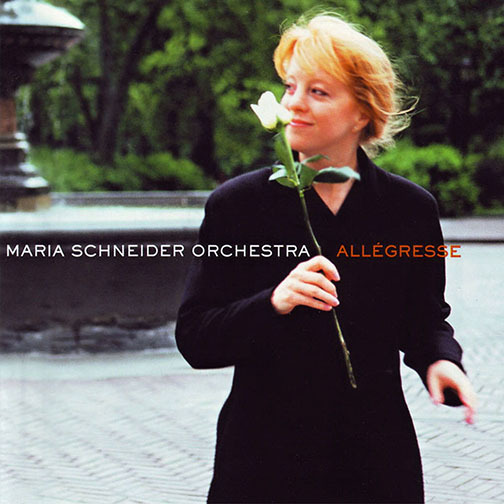 The Maria Schneider Orchestra constructs some lofty, towering big-band jazz on Allégresse. Schneider’s layered arrangements of her compositions sound damn near 3-D throughout.